The Mini-M group meets every week on a Wednesday, offering Worship&Fun, alternating with informal Chat&Play, for babies and toddlers with their parents/minders. Refreshments always available. Worship&Fun is generally 10am-11.30am; Chat&Play is generally 9.45am-11.15am, though times can vary occasionally, so please check here or the noticeboard outside the Church. Oh, and don't forget that we have a superb crèche facility, so feel free to stay a while for a drink and a chat afterwards whilst the children play - a great way to make new friends! All other Wednesdays you are welcome to drop in for chat/play/refreshments (normally 9.45-11.15). 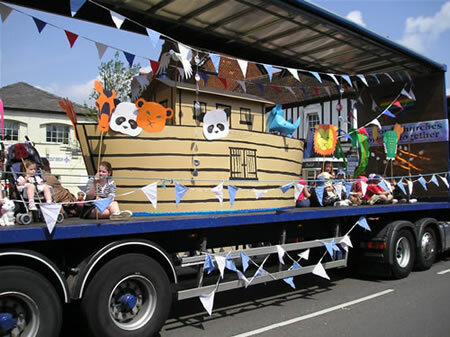 Sunday 3rd June 2007 saw our Mini M group joining the parade of floats at Shefford's annual Gala for the first time ever with their "Noah's Ark" themed float - see picture below!